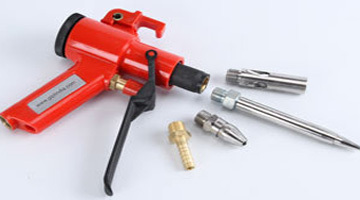 Type : Add on nozzles for ergonomic blow gun PSH-7. Blow Type : Adjustable thrust, medium penetration. MOC : Aluminum (RBA-2), Stainless Steel (RBS-3). Air Amplification : 12 times the compressed air consumed. Air Consumption : Upto 565 LPM (20 CFM) - when adjusted to its mean position. Confirms OSHA safety requirements : Yes. Inlet connection Size : 1/8" BSP male thread.